Building your young child’s knowledge about the world is serious business when they are tiny. They are like precious little blank slates, willing and ready to absorb anything that you impart to them, and it’s a big responsibility to impart the right things at the right time. On the one hand, you can’t cram them full of things they’re not ready to understand. If you try, you’ll quickly find that they either shut down, get bored, or start getting wild and wiggly. On the other hand, you don’t want to just leave it to chance that they will learn the things that they need to know. So how do you maximize the speed that you can build their knowledge and get it to stick? The answer is in designing experiences for your preschooler so that they will learn by exploring and discovering things for themselves. If you make the learning process into an adventure, the knowledge will stick and become part of their bank of experiences from which they will draw in building future knowledge. Let’s say that you read a banana bread recipe to your preschooler. Can you even imagine them listening all the way through to the end? You’ll probably even bore yourself. A child won’t be able to make banana bread from that kind of instruction. However, what if you take a different approach? You let the child pull up a stool to the counter. You pull out all the ingredients you’ll be using and line them up in a row in the order that you’ll add them to the recipe. You talk about their names and let the child look at them all. Then you allow the child to help by scooping, dumping, and mixing the ingredients, at your direction. 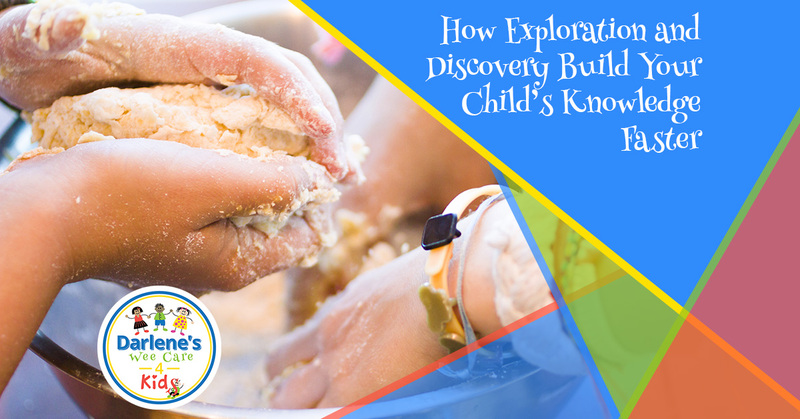 This process of exploration and discovery will show your little one many things. If I stir too fast, the flour will go everywhere! Oops! Cracking eggs and making them land in the right place is tricky business. And raw egg is slippery. When I touch the batter, my hands will get sticky and I’ll be tempted to wipe them on my shirt. I should wipe them on a rag or paper towel instead. I can do this! I was helpful! Here at Darlene’s Wee Care 4 Kids, we make it a priority to give your child the opportunity to learn by exploration and discovery. We want their educational experience at our daycare to be enriching, fun, and beneficial. Enroll your child today!